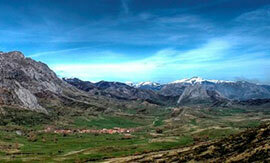 Our province is situated to the northwest of the Iberian Peninsula, in Castilla & León. It borders in the northwith Asturias and Cantabria, in the east with the province of Palencia, in the south with the provinces of Zamora and Valladolid and in the west with Galicia. León's province has an extension of 15.581 km2, where different types of landscapes are mixed, essentially mountains in the northern and western part; plains in the center, east and south; and rivers throughout the whole province. The climate in Leon is as diverse as its landscapes, hard, long winters with severe frosts; soft, short springs and autumns; and with hot and short summers, with cold nights. Gastronomically speaking the province of León is very rich, with many products under the I.G.P stamp or Brand Guarantee. Within the cured meats and sausages we have the “Cecina de León”, the “Botillo” from the Bierzo, both with the Protected Geographic Indication (I.G.P), and the “Cecina de Chivo” (cured goat’s meat) with the Brand Guarantee. Within the dairy products we have Valdeón Cheese with an I.G.P. Within the pulses the “Bañeza Bean” also has the I.G.P. In Fruit and Vegetables we have the Designation of Origin for the Reineta apple and the I.G.P for the conference pear, both from the Bierzo, the Brand Guarantee for the Bierzo grilled peppers, whereas the Fresno and Benavente Peppers have the I.G.P. Finally the Sahagún Leek has the Brand Guarantee. When talking about wines the two Designations of Origin stand out, Tierra de León (Land of León) and Bierzo. True reflections of this gastronomical culture are the numerous companies dedicated to the food industry throughout the province, as is the case of Ferju. EMBUTIDOS Y SALAZONES FERJU. Where are we? Our Company is located in the village of Pobladura de Pelayo Garcia, in the south of the province of León, in the “Páramo” region and bordering with the Esla river. Pobladura de Pelayo Garcia, with a land area of 20.2Km2 and 400 inhabitants, is the typical example of the villages that are fighting to improve the level of quality of the food products produced in the province of León. Our climate with its long, cold, dry winters and short summers make it the perfect place to produce cured sausages and meats. 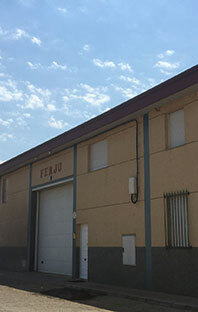 There are many ways to arrive at our installations, in the Contact section we will explain how.